Apr. 6, 2012, 6:00 p.m. 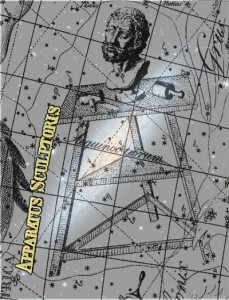 Apparatus Sculptoris (the sculptor’s studio) is a distant constellation in the southern sky. Creators, makers and performers invite you to experience the merger of the practical and the visionary in a surprising evening of experimental art, mechanisms, music and dance! This collaborative exhibit was created by students from the ASU School of Art sculpture area, along with students from the School of Dance and the School of Arts, Media & Engineering in the Herberger Institute for Design and the Arts. This exhibitition takes place at the Ice House, 429 W Jackson Street, Phoenix, Arizona, 85007.